Score chestnuts by cutting a shallow cross on the flat side with the tip of a sharp knife and place in boiling water for 5 minutes. Peel as soon as they’re cool enough to handle. Just peel outer skin and leave the fine pellicle on. Chop chestnuts into ½ centimetre pieces. Place dried mushrooms in a bowl of hot water and soak for 30 minutes. Drain, remove and discard tough stem, chop each mushroom into ½ centimetre dice and keep aside. Heat the oil in a wok or large frying pan over medium-high heat. Add chopped chestnuts, garlic and ginger and stir for a minute. Add the mince. Stir-fry with a spoon to break up any lumps for 3-4 minutes until mince changes colour. Add the shallots and stir through. Add wine, oyster and soy sauces and stir through for a minute. Add bean sprouts and sesame oil, stir through and remove from heat. Check for seasoning and add a little salt if necessary. 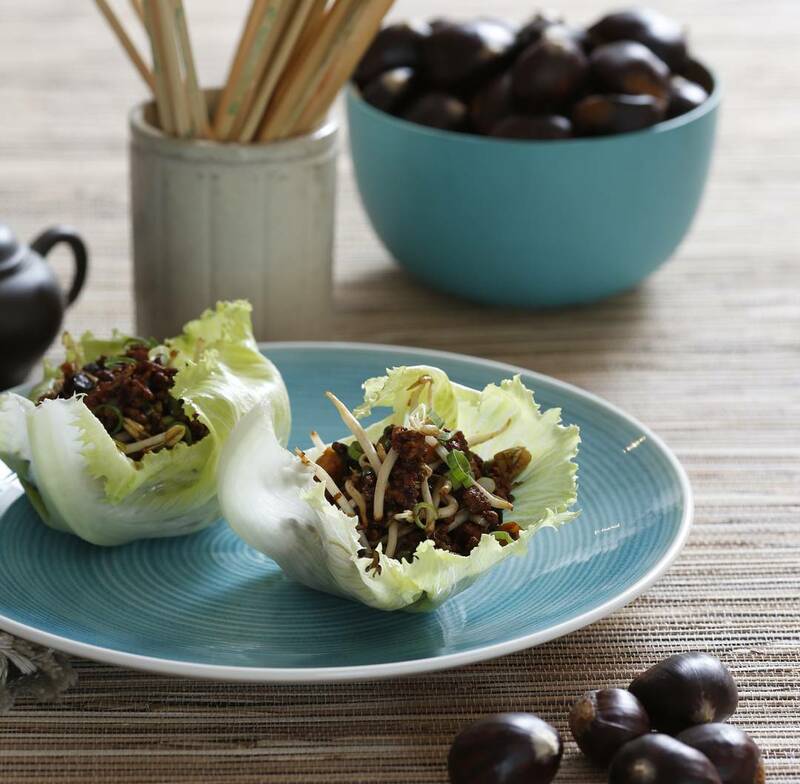 Spoon mixture into lettuce cups and serve..